I had a pleasant flight on Sunday from the Newark aerotow. The sky was looking great from 10am but we had a bit of a late start - it is a fair drive from York – and we didn't get airborne until early afternoon. You can see from the pictures that the sky looked amazing but the clouds were not working as you would expect with only 200 to 300 ft a minute climbs with the occasional 6-8 up's of super smooth one handed turning. We set a goal to Whitby which as I think on was a mistake. I have made Whitby before but as its a seaside town and so on a good day will have sea breezed! A Pickering goal next time I think? The wind on the airfield was SSE so would be blowing us into the airspace that splits N and S so we would have to stay East of the Derwent then West of the Humber bridge to avoid Humberside airspace. The tow was without problems (cheers Bob) and I pinged of at 1800' in a 2up. Didn't get to base and was thinking that the ground would meet me before the next climb but thankfully that was not the case. Another 1-2up under an amazing black bottom perfect cloud but again not to base so off we go again cross wind to the next amazing looking cloud and again 2up! This time I was able to take it to the top at 5500 and boy it was cold. Must have been freezing at base. Now I have more options and decide to glide through a blue hole and half way get my first 6up in the blue! I keep looking up and see the birth of a Cu that I meet and wish it well and on my way I go again. 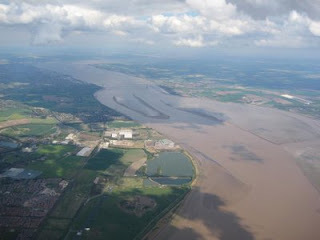 Now I can see the Humber estuary in the distance and a small gliding club. A couple of gliders on the ground and only one flying but not turning. 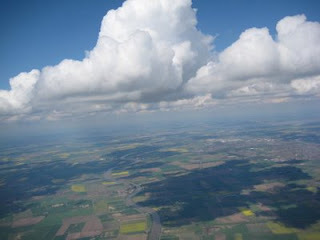 I fly over around 3000ft under a lovely black bottomed cloud that is hardly working at all only ½ up zero – oh dear where to go now? 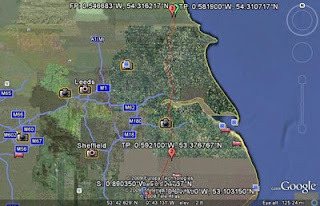 Can't go too far to the West or the East because of airspace and to the North direct is blue and the Humber is pretty wide at this point so we hanger almost 90degree West towards Scunthorpe steelworks. I get to the lowest part of the flight (apart from the end) at almost 2000ft and just dribble along in a ½ up and head again towards the steelworks where I can see them pouring moulton steel out in the open – its like the surface of the sun incredibly bright. I then bimble into a 3-4up which I take up to base which is now 6000ft and colder. 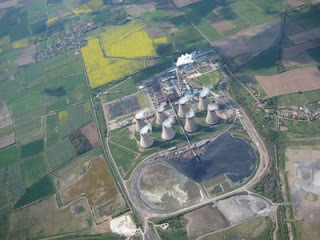 I then glide directly over the steelworks to the next best looking cloud and top up en route in a beautiful smelly 6up from the works. I can now head north again to cross the Humber as the sky all starts to fill in, the big blue holes are rapidly disappearing but there is a thin strip directly of where I am of sunshine on the ground. Half way across the Humber I get a beautiful super smooth 4up which takes me back to base again at 6200ft. Now wondering where to go. Do I fly home to York? Or do I continue to the goal? I went for the goal. Its now a slow, slow glide – squeaking all I can from the glider bimbling into ½ups and zeros. The wind now is SSW 13-15mph. So am getting a perfect blow up the backside. I scramble along wishing I'd flown to York and landed in my back garden as the sky is now totally overcast and over to the east I can see a seabreeze front. I've been in this situation a few times before and this situation is fine as long as its in the flats but as soon as it hits the Moors and the high ground it destroys the front and does all sorts of strange things. Which is exactly what happened! I get to where the tendril cloud was but has now gone and it is very very rough with nothing going up. I fly along and it smooths out and I'm low and picking out fields to land still with 13ish mph of wind showing on the instrument and then bang I'm into an extremely rough 6up which almost turns the glider over sideways on two occasions. I hang on and then suddenly its gone, I search around but can't find it and so go for a glide down wind and I am now motoring over the ground. I turn above the field I aim to land in and realise I'm drifting backwards! I pull a little VG, maintain and just literally come down vertically fighting the glider all the way with really turbulent air – perfect landing without incident – glad to be on the ground at that point. 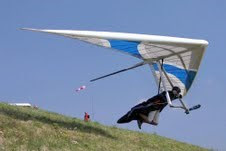 The wind is so strong SSE I can hardly walk with the glider. I was 19km short of Goal at Whitby! It was an extremely enjoyable flight and the Moyes RS 3.5 is performing very well. I am getting more and more comfortable with every flight. I am getting it more to my liking now with very neutral coordinated turns as I find high siding very tiring on a long flight and have got the nice light bar pressure - maybe too light? ;-) Just need a little hill soaring with top landing for the final tweaks. 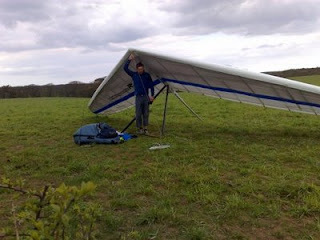 Thanks again for the tow Bob and a big thanks to Doris too who arrived just as I finished packing away the glider and just in time to get to the pub for a Sunday Lunch and pint of Real Ale. A perfect end to a near perfect day.